A contour swale is a broad, shallow channel often planted with a dense stand of vegetation covering the side slopes, top, and bottom. Swales can be natural or manmade and typically have several advantages over conventional storm water management systems including the reduction of peak flows, the removal of pollutants, the promotion of runoff infiltration, and lower capital costs. Vegetated swales are typically located along property boundaries along a natural grade, although they are most effective on large sites, such as farms and parks, where many swales can be constructed thereby increasing the total combined water-holding capacity. Swales can be used in place of curbs and gutters along parking lots and often referred to as rain gardens. swale slope as close to zero as drainage permits, hence the term “contour swale’ where the swales are constructed along contour lines so that rain entering the system is held in the swale. 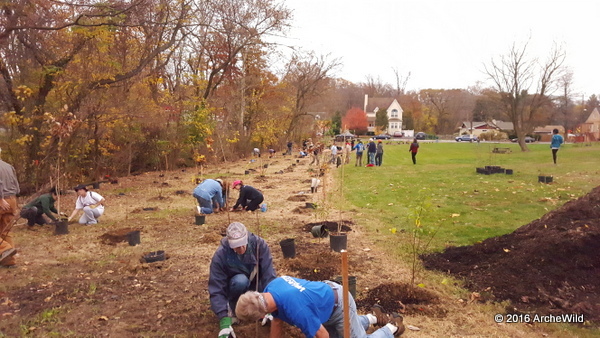 Others recommend a 2-4% slope along the bottom of a swale whenever storm water is desired to travel to a particular destination, such as a pond, but sloped swales tend to erode unless their bottom surfaces are hardened. The literature suggests that vegetated swales represent a practical and potentially effective technique for controlling urban runoff quality. While limited quantitative performance data exists for vegetated swales, it is known that check dams, slight slopes, permeable soils, dense grass cover, increased contact time, and small storm events all contribute to successful pollutant removal by the swale system. Factors decreasing the effectiveness of swales include compacted soils, short runoff contact time, large storm events, frozen ground, short grass heights, steep slopes, and high runoff velocities and discharge rates. The effectiveness of vegetated swales can be enhanced by adding check dams at approximately 50 foot increments along their length. These dams maximize the retention time within the swale, decrease flow velocities, and promote particulate settling. Structures to skim off floating debris may also be added to the swales. Finally, the incorporation of vegetated filter strips parallel to the top of the channel banks can help to treat sheet flows entering the swale. The useful life of a vegetated contour swale is directly proportional to its maintenance frequency. If properly designed and regularly maintained, vegetated swales can last indefinitely. The maintenance objectives for vegetated swale systems include keeping up the hydraulic and pollutant removal efficiency of the channel and maintaining a dense, healthy cover cover. Maintenance activities should include periodic mowing (with grass never cut shorter than the design flow depth), weed control, watering during drought conditions, replanting bare areas, and clearing debris and blockages. Accumulated sediment should also be removed manually if contaminated or plowed up onto the uphill side of the swale to avoid the transport of sediments and to preserve its water holding capacity. The application of fertilizers and pesticides should be minimal. Another aspect of a good maintenance plan is repairing damaged areas within a channel. For example, if the channel develops ruts or holes, it should be repaired utilizing a suitable soil that is properly tamped and seeded. Sections of the swale that are continuously “blown out” should probably be hardened with R5 riprap or additional swales built uphill to reduce and slow downhill flows. The crop cover should be as thick as possible. 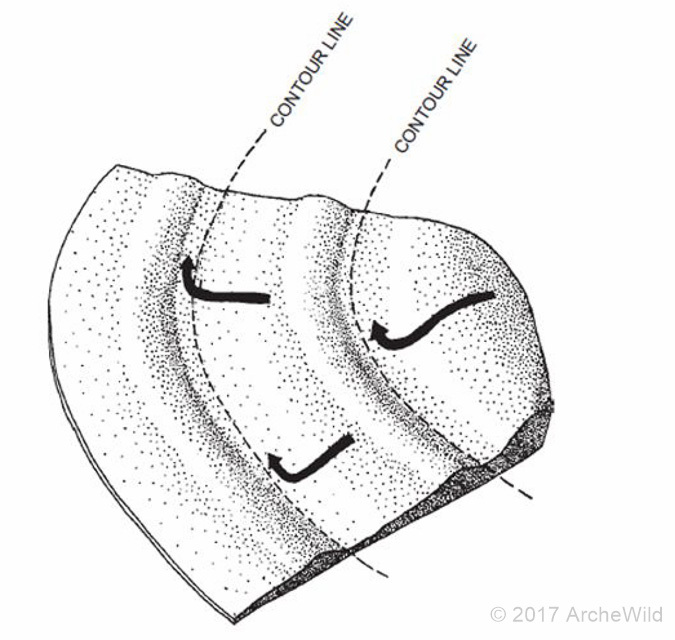 The internet is abound with confusing articles and videos about how to build a contour swale. 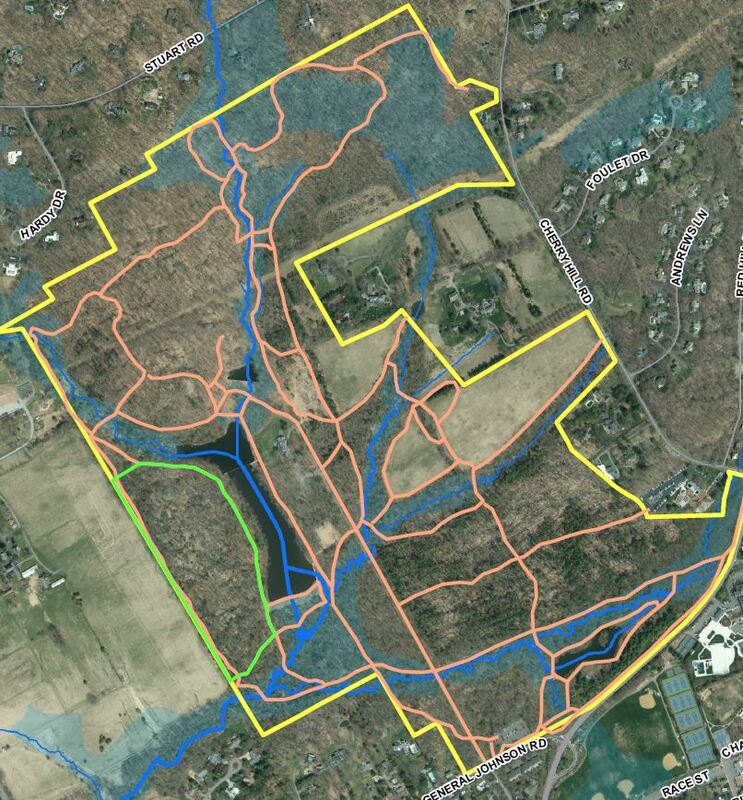 ArcheWild has constructed literally miles of contour swales for farms converting to conservation agriculture methods. While constructing with readily available construction equipment, such as an excavator, can be accomplished, it is often slow, messy, and expensive. ArcheWild has experimented with several techniques and specialized pieces of equipment to discover probably the most cost-effective method for large farms and parks. With a little work, anyone can likely find the necessary equipment locally at yards selling farm equipment. 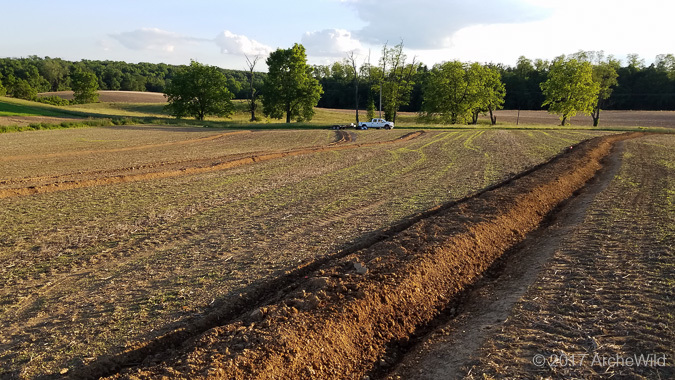 Step 1: Determine the number, length, and location of contour swales you need to accomplish both your farm or crop goals and your storm water management goals. This is probably the most difficult step and seeking technical assistance is recommended. Step 2: Roughly locate the ends of the swales and mark out the contour with marking paint. 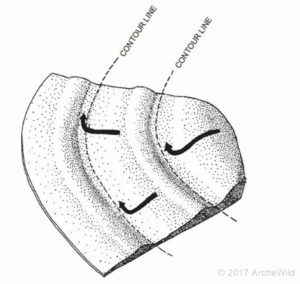 This allows you to assess the future path of the contour swale for obstructions, such as large rocks, trees, or other features you don’t want to disturb. Eye-balling the contour line is usually not possible. If you encounter obstructions, you must relocate the swale and perhaps adjust the placement of any other swales in the system. Step 3: Eliminate existing vegetation. The recommended process is to cut down or mow existing vegetation, let it recover for 3-4 weeks and treat with a suitable herbicide. Wait another 3-4 weeks to verify herbicide effectiveness. Use a drag harrow to loosen the top of the soil surface and to remove any debris. Allow a light rain to fall or lightly water the area to encourage weed seed germination. Kill these weeds with a weed dragon or another herbicide treatment. Step 4: Use a transit to mark your contours. This is best accomplished with an experienced crew of 2 or 3 people equipped with walkie-talkies. Rent a self-leveling unit from an equipment rental company to help reduce the change for errors. Mark the contour every 15 feet with construction markers, which are small plastic flags on long spring metal shafts. Any Lowe’s will carry these. Buy the longer ones, not the short ones. Choose a visible color. Unless you’re building a swale in your back yard, forget the DIY A-frame level; it’s not suitable for any installations larger than your back yard. Ok, now you’re ready for the fun part. You’ll need access to at least a 45-horsepower tractor with a 3-point hitch for these next steps. You can borrow one or rent one. If you have a local farmer with a 90-HP tractor, that is even better. 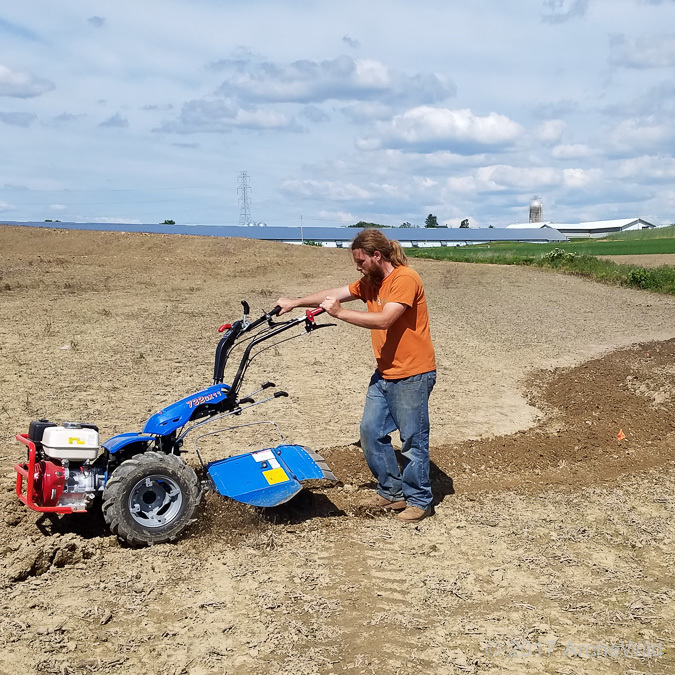 Step 5: Use a single shank ripper that can cut at least a 24″ path to rip just offset uphill of your contour flags and make five additional passes about 12″ apart on the uphill side of your swale, for a total of 6 cuts. Try to avoid destroying your contour flags; it’s possible. Step 6: Rent or buy a used 3-axis scraper blade to begin to move loosened material downhill towards your flags. The number of passes you need to accomplish this is dependent on your soil condition and time of year. This performs most of the soil moving for building the swales. Step 7: Rent or buy a used rotary plow and finish shaping the swales on both the uphill and downhill sides. Step 8: Immediately plant and rake in a stabilization seed mix. The options vary greatly and technical assistance might be required. Avoid using turf grass blends or annual rye grass unless you want a grassy berm. An excellent performer that will not impede the planting of any other crop is Eragrostis spectabilis, or purple love grass, as it germinates quickly, can tolerate arid conditions, is quite attractive, and easily outcompeted by future crops. Visit our Agroforestry page for pictures depicting many of the 8 steps listed above. Contact ArcheWild if you want us to assess the suitability for contour swales on your farm or property and for a quote to have us build them for you.